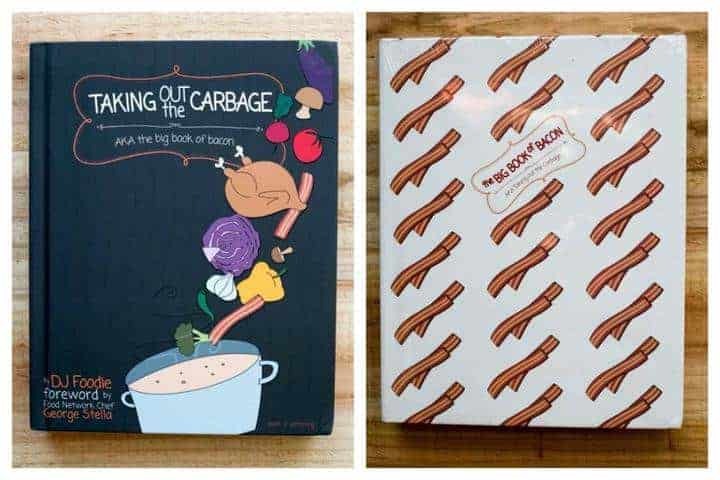 Although there are many low carb recipes available on the internet, I’m always adding real cookbooks to my collection. Many of the books in my collection have inspired me to create my own recipes. And, one day, I may even have enough time to author my own cookbook. Recently, I discovered Taking Out the Carbage. It’s a fantastic book written by DJ Foodie who also runs a successful low carb food blog. I received a complimentary copy of the gorgeous hardcover book along with the eBook version. The size of the book and number of recipes blew me away! 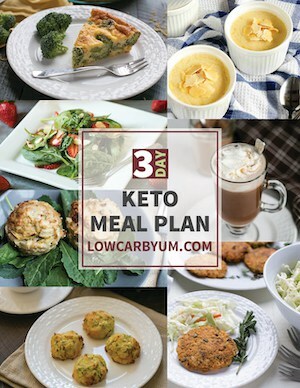 This is a must-have low carb cookbook for your collection! The book itself has 574 pages and weighs close to 6.5 pounds. 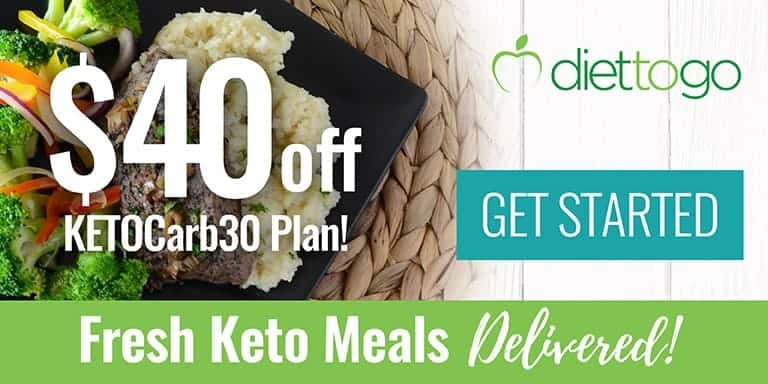 And, it’s filled with 226 tasty low carb recipes and practical information to help any one succeed in this way of eating. 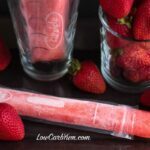 It even comes wrapped in bacon paper making it a perfect low carb gift! 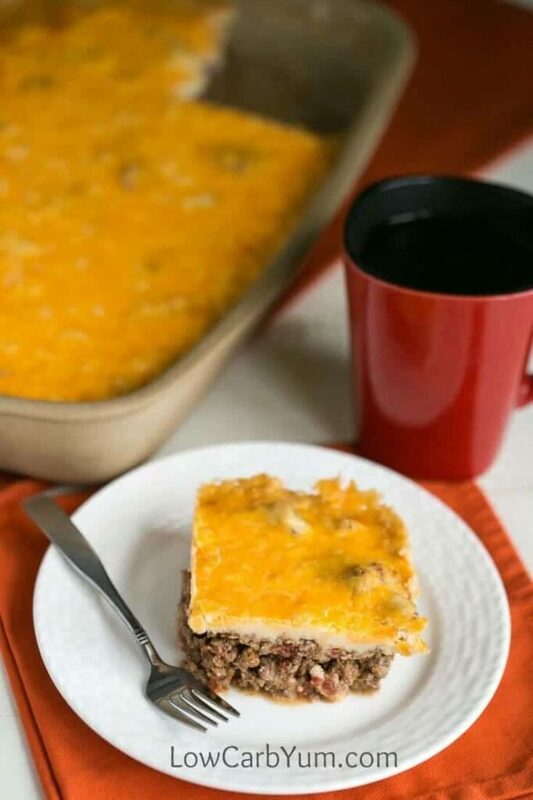 This Mexican taco casserole bake was inspired by the Spicy Burger Casserole recipe found in Taking Out The Carbage. 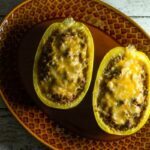 I simply replaced the spicy burger filling with a slightly modified version of my Mexican Zucchini and Beef recipe. 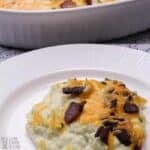 The cheesy mashed potato like topping that DJ Foodie used on his Spicy Burger Casserole is genius. Using it to top my basic Mexican beef gave the casserole a taco like taste. And, the dish was a winner with my family. 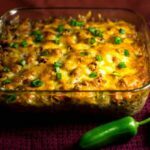 If you love the taste of tacos, or just Mexican food in general, this beef taco bake is something you are going to want to try. It’s so easy to put together, too. 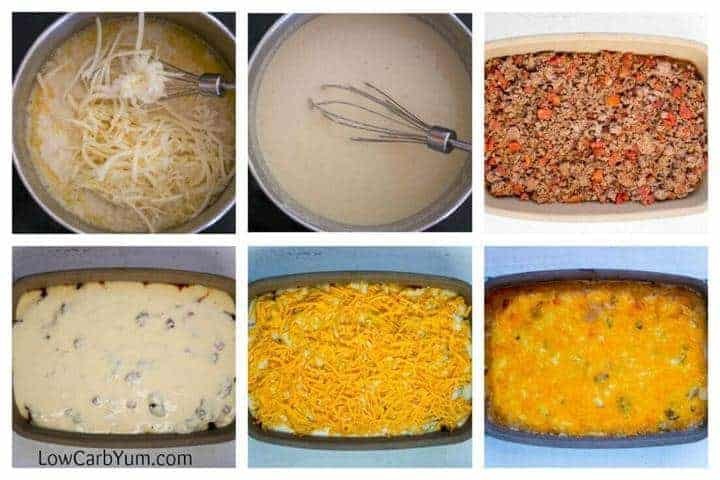 The casserole is easier to put together than a layered taco bake like my Mexican lasagna. And, there’s no tortillas to worry about! 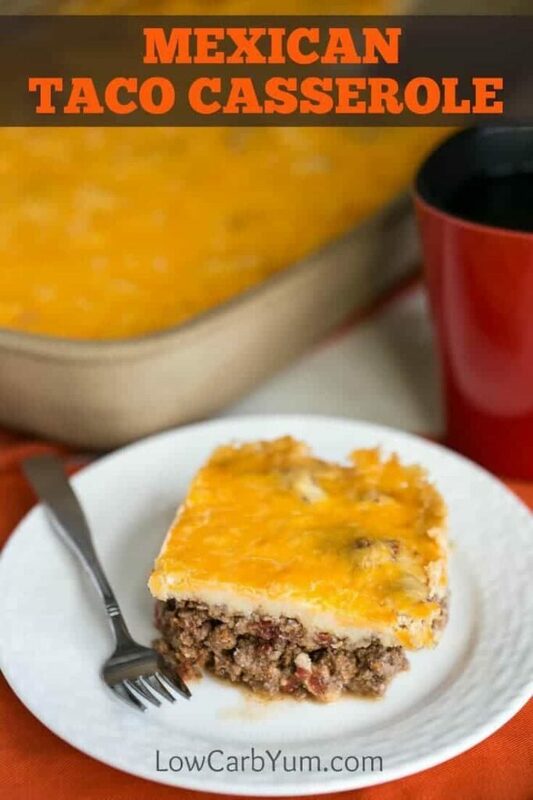 The topping for this Mexican taco casserole is simply a mix of water, almond milk, almond flour, butter, and cheese. 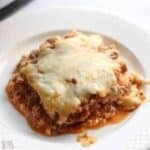 It’s a cinch to make and makes the finished dish very similar to a shepard’s pie. 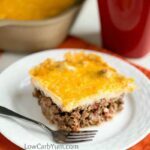 In fact, I may just try using the idea to make a low carb version of shepard’s pie. 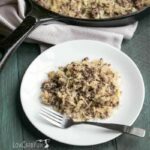 Once you try the almond flour based mashed topping, I bet you’ll find more recipes to use it for. I used two types of cheese in the casserole. Extra sharp white cheddar was mixed into the almond flour mix and sharp orange cheddar was sprinkled on top. It’s best to shred your cheese fresh with a hand grater or food processor. The pre-shredded kind sold in bags is mixed with a starchy anti-caking powder so it has unnecessary carbs. I baked the Mexican taco casserole in a 9×13-inch stoneware pan. 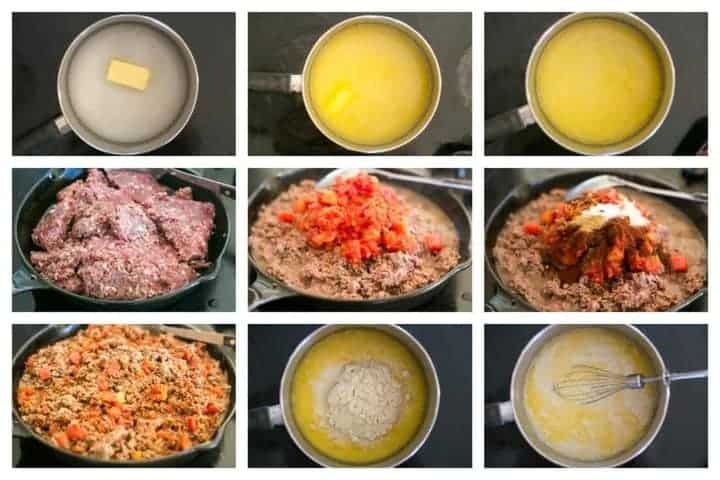 If it’s too much food, the recipe can easily be cut in half and made in an 8×8 or 9×9 square pan instead. Stoneware has always been my favorite pans for baking. I find them easy to clean and love that they hold the heat so well. Once I started using stoneware for baking, I was sold. I think you’ll be sold too if you give it a try. If you aren’t using stoneware pans, you should definitely give them a try. To up the flavor of this Mexican casserole even more, try adding on some sauce. 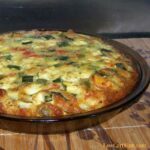 I like the gluten-free enchilada sauce over at Low Carb Maven. 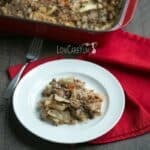 Casseroles are one of my favorite dishes to make during cooler weather. I find them so warm and comforting. We eat a lot of them over the winter. Soups and stews are my other favorites to enjoy when it’s cold outside. DJ Foodie’s cookbook has a whole chapter devoted on them. His taco soup and creamy smoked salmon chowder are recipes I’d like to try this winter. The cookbook is full of so my great looking recipes, it’s tough to choose. Want to sample some of DJ Foodie’s recipes before deciding, you can visit his blog. Just click on the blog link at the bottom of this page. I’d like to thank DJ Foodie for sharing his gorgeous cookbook with me. All his recipes are focused on real whole foods which is something that I believe it very important. Taking Out the Carbage is such a wonderful book to have and share. I’m planning to buy a few copies to give out as gifts this year. 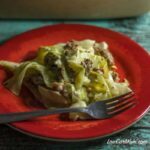 If you like this recipe, you may also want to check out my Yellow Summer Squash Taco Bake. 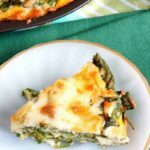 It’s one of the first recipes I ever published on this blog and has been a favorite with readers for over six years. 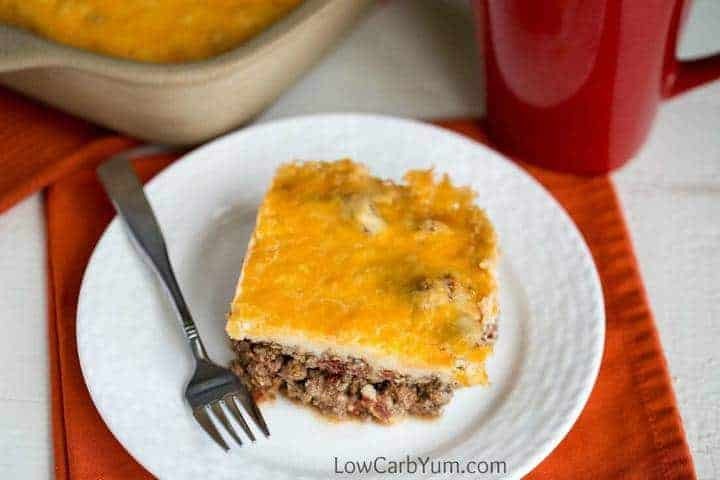 A unique low carb taco bake that's sure to be a winner. 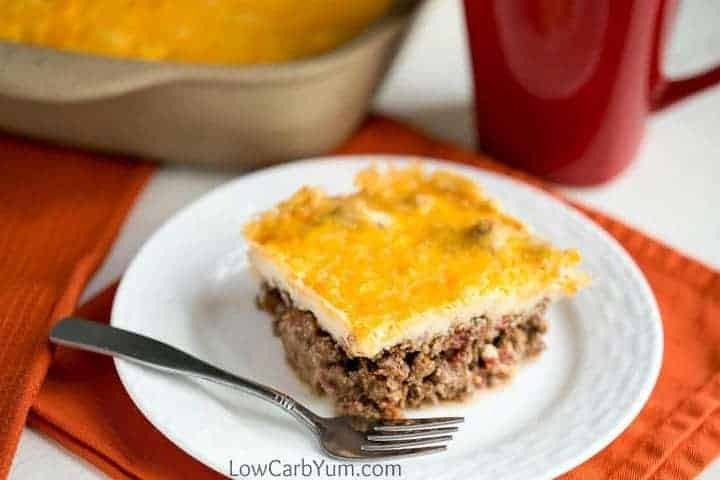 It's got a spicy ground meat base topped with a cheesy mashed potato-like topping. Bake at 350F (177C) for about 25 to 30 minutes. Serve! Adapted from a recipe in Taking Out the Carbage.